Villa Lucques Vollkommen klimatisiert mit privatem Parkplatz und Gemeinschaftspool. Eine von 2 - 2 Schlafzimmervillen alle auf 1 Niveau. Vollklimatisiert, mit einer geräumigen, gut ausgestatteten Küche mit Gasherd, Ventilatorofen, Geschirrspüler und Waschmaschine. Mit eigenem Garten, Sonnenterrasse und Grillplatz. Alle auf privatem Grundstück mit eigenem Parkplatz abseits der Straße. In einem ruhigen Dorf Lage 5 Minuten Fahrt von St Chinian mit es ist zweimal wöchentlich Markt, Restaurants, Cafés und Bars. Hervorragendes Wandern / Mountainbiken durch die Weinberge rund um das Dorf und nur 12 Kilometer vom Canal du Midi entfernt. Es gibt eine Boulangerie im Dorf für Ihr Frühstück Croissant und Baguette und eine Höhle Genossenschaft für die obligatorische Weinprobe. Wir haben einen tollen Urlaub in der Villa Lucques verbracht. Haus und Garten sehr sauber und schön. Der große und sehr schöne Pool war für unsere Kinder das Highlight. Die Vermieter sind sehr nett und hilfsbereit. Man kann viel unternehmen: Rad fahren, wandern, Kanu fahren, Strände besuchen etc.. Wir würden jederzeit wieder kommen. Mit unserem 7-jährigen Sohn verbrachten wir drei herrliche Juliwochen in der Villa Lucques. Das Haus ist prima – neu, sauber, geschmackvoll, mit großer Küche samt Gasherd. Auf der Terrasse und im eigenen Garten lässt sich wunderbar die Zeit verbummeln, der Pool sorgt für Abkühlung. Und das idyllisch gelegene Cébazan ist der ideale Ausgangspunkt für Ausflüge in die Region – ans Meer, den regionalen Naturpark Haut-Languedoc mit Flussbadestellen in Roquebrun oder den Gorges d’Héric, nach Carcassonne, Narbonne, Béziers und und und. Thank you, Alyson and Brian, for being such kind and friendly hosts! We would love to come again. A lovely place to stay in every respect! We received a very warm welcome from the owners who were on hand to help us throughout our stay. The house itself was lovely, lovingly decorated and absolutely immaculate. We enjoyed relaxing on the large terrace and in the beautifully kept gardens. The pool was perfect too. 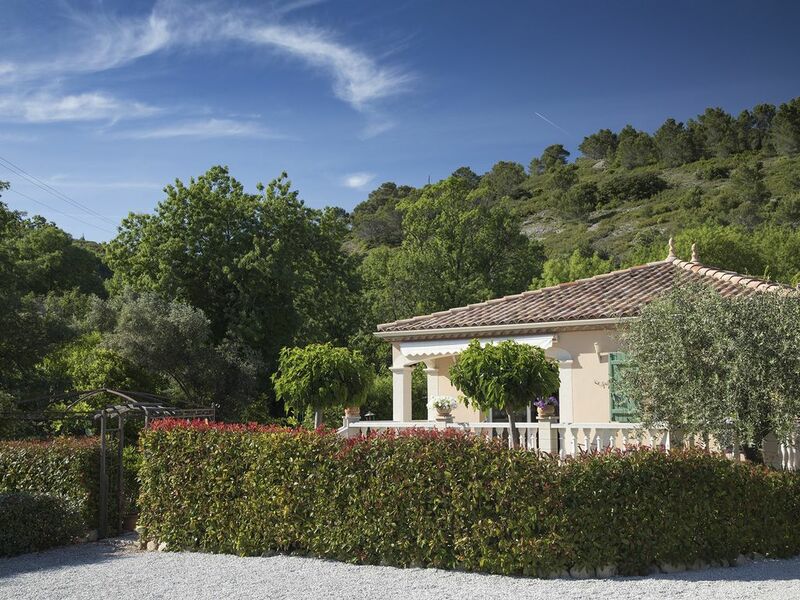 I can highly recommend this property for a relaxing holiday in a beautiful part of France. Perfect. The house is well equipped and beautifully decorated and the outside space a real bonus - not only do you have a terrace but a private garden where you can sit in sun or shade. The pool is brilliant and we were able to swim even at the end of September and the view from the pool is stunning. The location is ideal, you can walk up to the Cave or boulangerie and there are plenty of restaurants close by. Alyson and Brian are the perfect hosts and we can't wait to return. Wonderful property which is well located for exploring the local area. My wife and I had a fabulous 2 weeks with our 2 year old son. Alyson and Brian were excellent hosts and made sure we had everything we needed, including providing 2 boxes of toys to the great delight of our son. We enjoyed many meals on the terrace and had a dip in the excellent pool every day. The house was very well equipped with shutters and air conditioning to help keep it cool in the 30+ degrees heat we had on most days. The Wi-Fi worked very well and meant we could plan and book meals and trips with ease. The kitchen was very good and well equipped. Cebezan itself is very quiet, but the local boulangerie meant we had a good supply of bread and croissants. The quiche we bought from there was very good. Saint Chinian is just over the hill and has a superb market every Sunday and a smaller one on Thursdays. We made good use of it and the Intermarche, which has the most spectacular views. The beach was only 40 mins away and everything seemed to be easy to drive to and within an hour. Our favourite place was Roquebrun. A lovely place to enjoy the River Orb and have a picnic. Overall, we had a fantastic holiday and this has been the best property we've stayed at.